Mastro just completed another great auction last week. Even in a slowing economy vintage material continues to garner big prices. 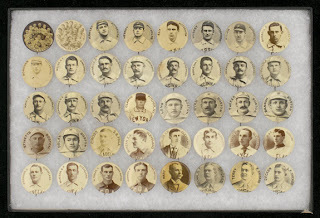 Below is a group of 1885-1886 Brooklyn Grays scorecards with player portraits. They feature 4 different players of one of the Dodgers earliest teams. Incredibly, they are all scored. May 2nd 1885 - vs. New York Metropolitans (VG/EX; Brooklyn lost, 2-8; Valentine is penciled in as the Umpire; catcher Will F. Krieg is pictured on the cover; blank backed), September 9th 1885 - vs. Louisville Colonels (VG; lost 3-7; Eddie West is penciled in as the Umpire; third baseman W. H. McClellan is pictured on the cover; ad back), September 25th 1885 - vs. St. Louis Browns (EX; lost 3-6; Kelly is penciled in as the umpire; pitcher Jno. J. Harkins is pictured on the cover; ad back), and June 5th 1886 - at Philadelphia Athletics (VG/EX; Brooklyn won, 14-10; Kelly is again penciled in as the Umpire; left fielder G. E. Swartwood is pictured on the cover; blank backed). They sold for an healthy $4,500.00. 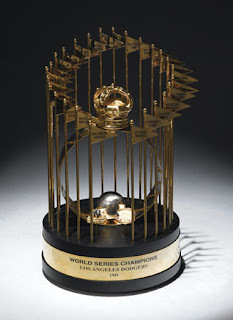 Another 1981 Dodgers World Series trophy sold for $2,300.00. It's a salesman sample. Below is another salesman sample. 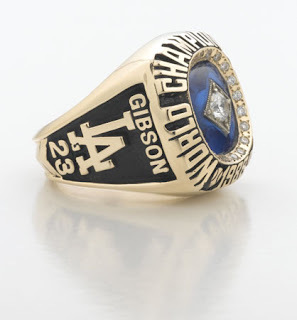 This time its Kirk Gibson's 1988 World Series ring and it sold for $2,000.00. 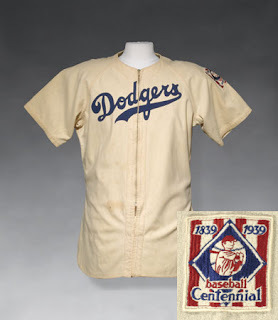 Here is a great vintage game-used Dodger uniform of Fred Singleton from the year of the Baseball Centennial in 1939. It comes with the commemorative patch on its left sleeve and is in incredible condition. In 6 Major League seasons Fred Singleton played sparingly, but he isn't known for his Baseball prowess. He was a great college football player. In 1955 he was elected into the College Football Hall of Fame as an All-American tackle for the University of Alabama. This uniform sold for $3,250.00. Below is a very large grouping of some of the rarest Baseball pins in existence. They are from 1898 and were produced for Cameo Pepsin Gum. The two below are of Hall of Famers Kid Nichols and Buck Ewing. This collection of 64 pins sold for an astounding $72,500.00. 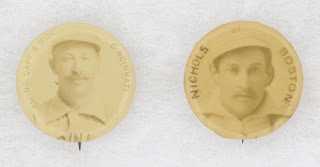 The Whitehead & Hoag Company of Newark, NJ produced these early 1-1/4" celluloid baseball pins as premiums for their neighboring firm, the American Pepsin Co. These pins were distributed with that latter firm's Cameo Pepsin Gum product and carried back paper advertisements for the confection...This impressive grouping of 64 different pins displays a total of 45 Pepsin back papers and 11 others that have 11 Whitehead & Hoag inserts in their stead. The remaining eight have no paper at all. This is an unusually high percentage of surviving coverings for any cello pin collection of any vintage, and remarkable for a 19th century set. Actually there are a number of amazing characteristics about this collection, beyond its high percentage of surviving back papers. There are visible cracks on only one example (Hutchinson), and that is a single crack that blends in with the image! Most of the pins grade EX or better, with many Near Mint or better examples in their midst. These pins are seldom found with such a uniform high grade appearance, where all of the images are clearly visible with highly legible captions. Only a few of these demonstrate any stains, and on those few examples the staining is unobtrusive, providing no distraction from the pin's attractively preserved subject. This is easily one of the finest holdings in our hobby, containing many examples that were once part of the fabled Copeland collection. 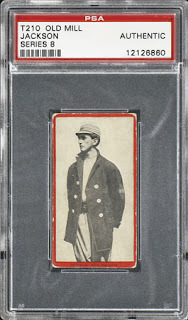 The most sought after Shoeless Joe Jackson Baseball card also sold. It is his 1910 T210 Old Mill Cigarettes card. Even is just "Authentic" condition it sold for $85,000.00. Only about 10 cards are known to exist as it features him with the New Orleans Pelicans of the Southern League.